Govt. Jobs: Mahila Bal Vikas Vibhag Parbhani Bharti Recruitment 2018. 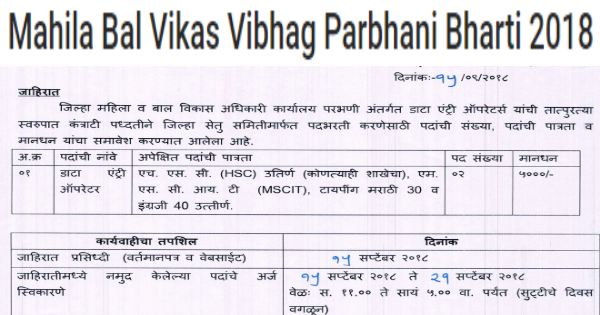 Mahila Bal Vikas Vibhag Parbhani Bharti Recruitment 2018. 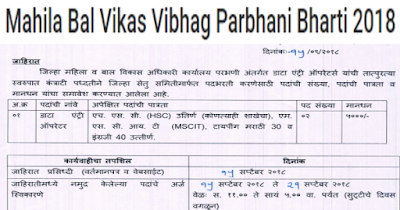 Mahila Bal Vikas Vibhag Parbhani Bharti Recruitment invites job application. This jobs is for the Data Entry Operator Posts. Candidate from the Parbhani Maharashtra will apply for this job. This is a great chance for interested candidates. Post Name: Data entry operator Posts. 10th Pass for more details Please Check Official job link provided below. Last Date for Submission of Application: 21 September 2018.